 USA vs China - Who will Win the Electric Car War? Will China's Electric Car Startups Sink Tesla?  Top Six Latest Automotive Tech that will Keep Your Teen Drivers Safe.  New Vehicle Subscription Services to Offer More Choices, Freedom - and may be more economical than buying. Learn how to buy the vehicle you want at the price you can afford - without the sales pressure, headaches and hassles. 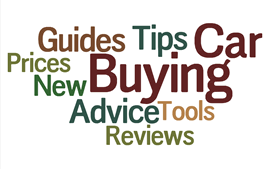 Car Buying Strategies offers buying guides, tips and advice that will help walk you through the car purchasing process. How to Buy New Cars Below Dealer Invoice Prices - Save Thousands without negotiating with a salesman. The Best Car Buying Websites - These websites will save you time and money without the usual hassles and headaches associated with the new car purchasing process. How to Leverage the Top Car Buying Service to Save Thousands - Buying a car doesn't have to be Hard. 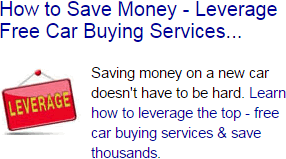 Learn how to leverage the top online new car buying services & save! Top 40 New Car Buying Tips - Follow these tips and avoid costly mistakes. 10 Car Buying Mistakes - These mistakes can will drain your wallet. Top 6 Dealer Selling Systems - Being aware of these can provide you with more buying power. Dealer Cost Calculator - True dealer cost is a must know when buying new cars. Low Interest Rates VS Rebate Calculator - What finance deal is better for you? How to Buy Used Cars - Covers tips and buying advice on how to buy used cars. Are Low Manufacturer Interest Rates the way to go? - Low advertised financing rates can yield a higher cost of borrowing than traditional bank rates. Don't buy a new car untill you determine what loan will save you the most on interest. 10 Auto Loan Mistakes - Financing is a big part of the car buying process. Avoid these mistakes. Don't overlook car insurance costs - When it comes time to make a new car purchase, you can save a good chunk of money with these tips. 10 Car Insurance Mistakes to avoid - Shopping around for the best deal is something that everyone should do, but there are many mistakes that people make when buying car. Shopping for a new ride can be one of your most memorable experiences. However, you should always do the proper research before making a final decision. Here are some essential tips that you need to remember. The majority of vehicles on the market are available in multiple trim levels. Unsurprisingly, the base model is going to be the least expensive option. If you decide to pack on more upgrades, the vehicle’s price will begin to rise. Avoid selecting features that you truly don’t need. To prevent overspending, be sure to outline your budget beforehand. You can avoid a financial nightmare by being a smart car shopper. Remember, the vehicle’s actual price is not the only cost that you need to consider. Some of the other key expenses include auto insurance, fuel, and long-term maintenance. A car salesperson’s main goal is to get you to buy a vehicle. Their next agenda is to get as much money as possible. Although they may encourage you to check out a more expensive vehicle, never fall for the bait. You are the one who must keep up with the monthly payments. To avoid giving in to temptation, the best solution is to only look at vehicle’s that are in your price range. Most car dealerships offer various incentives throughout the year. These cost-cutting deals can save car shoppers a lot of money. While some incentives are designed for everyone, there are others that target a specific group of car buyers. For example, a dealership may advertise special discounts for recent college graduates. Certain vehicles are more popular than others. While one vehicle may sell very quickly, another model may sit for months on the lot. Often times, dealerships will provide special deals for slow sellers. This is a great opportunity for the people who actually like the vehicle. You can own a car that is usually thousands of dollars more expensive. It is always a good idea to know your credit score. If you don’t plan to pay for the vehicle in cash, you will likely need to take out a bank loan. A good credit score will obviously give you more flexibility. Luckily, some dealerships offer special deals to the customers who have a poor credit history. The invoice price is essentially the amount of money that the dealership paid for the car. Keep in mind that most car dealerships receive discounts from the automaker. The dealership likely paid significantly less money than what is stated on the invoice slip. Nonetheless, you still need to compare the invoice to the vehicle’s advertised price. An auto buying program can save you a ton of cash. Some of the most popular companies include Costco, Consumer Reports, and American Express. There are also several others that you can find by searching online. If you have a membership to one of these groups, you can expect to receive major savings. Although a vehicle may have an advertised price of $18,000, the dealer fees may cause the total cost to exceed $20,000. Some of the mandatory charges include sales tax and the destination fee. You will also need to pay for the tags and registration. On the other hand, there are certain dealer fees that you should not pay. Don’t waste your time by looking at a car that you cannot afford. If you plan to finance the vehicle, be sure to get pre-approved ahead of time. If you are unable to get approved for the loan, simply keep searching for another ride. You can avoid the hassle of even going down to the dealership. When attempting to close the deal on a new car, you always want to maintain the upper hand. Always check with an outside lender before accepting the dealership’s financing rates. You should also avoid mentioning a trade-in while negotiating. After the car’s final price has been agreed upon, you can then try to sell your old ride. If the proposed deal is not in your best interest, walk away before signing any paperwork. You may need to travel to another dealership. This is definitely not an once-in-a-lifetime opportunity. Unreasonable car dealerships do not deserve your business. While there is no overlooking the excitement of buying a new car, be sure to take the necessary precautions. It is a decision that you should not take lightly. By taking the time to do some extra research, you can avoid a lot of stress in the long run. These tips will definitely help you to snag a good deal. The key is to do some preparations before heading out to the dealership. Always try to save money when shopping for a new car. See more car buying tips.